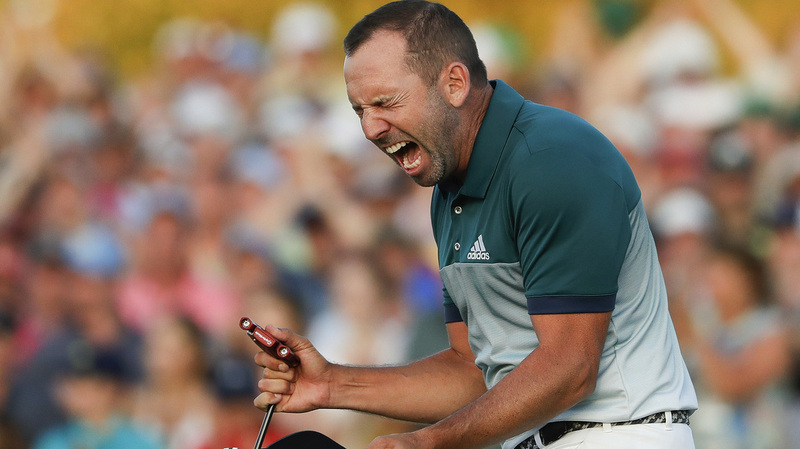 Sergio García Bests Justin Rose To Win Masters, His First Major Championship : The Two-Way Before the sudden-death playoff, Spain's Sergio García trailed Englishman Justin Rose by 2 shots with 6 holes remaining. After Sunday's dramatic finish, it was García who was wearing the green jacket. Sergio García of Spain reacts after making his birdie putt on the 18th green to win the Masters golf tournament after a playoff against Englishman Justin Rose on Sunday in Augusta, Ga.
Golfer Sergio García of Spain slipped on the green jacket after a dramatic finish over Englishman Justin Rose at the 81st Masters in Augusta, Ga., on Sunday. Before the sudden-death playoff, García trailed Rose by two shots with six holes remaining. Rose sent his first playoff drive into the trees on 18 and managed to punch out before failing to sink a 15-foot par putt. That opened the door for García to win the title by two-putting from 12 feet out. García wasted no time wrapping up the Masters, sinking a birdie putt before crouching in disbelief while hearing chants of "Ser-gee-oh! Ser-gee-oh!" from the gallery. Rose patted his opponent on the cheek before they embraced. García and Rose began the final round tied for the lead before carding 3-under 69s to finish at minus-9. "I'm going to enjoy it for the rest of my life," García said after winning his first major championship. Rose said, "If there's anyone to lose to, it's Sergio. He deserves it. He's had his share of heartbreak." An ecstatic García forever crossed off his name from the list of best golfers never to win a major. Thirty-seven-year-old García is in the top-10 in career prize money, but he played in 70 major tournaments as a pro without a victory. Several years ago he said he wasn't good enough to win a major — that changed Sunday after García and Rose battled to the end. García is the third Spaniard to don a green jacket, joining the late Seve Ballesteros and José María Olazábal. The final round duel also was notable for its sportsmanship. Several times García and Rose applauded each other for great shots.